Credit is the lifeblood of housing. Without credit, housing does not get built and home buying is possible only for those with enough cash to cover the full costs. We live in a society in which many homebuyers lack the ability to come up with large downpayments. Thus, the availability of low downpayment loans for first-time buyers is critical to recovery of the for-sale market, especially now that so many homeowners are underwater on their mortgages and unlikely to sell until doing so does not force them to suffer a loss. This is one of the main reasons that the Federal Housing Administration (FHA)—an agency launched in 1934 to get credit flowing to housing during the Great Depression—has been so essential to this housing recovery. Apart from FHA, access to low downpayment loans all but evaporated for home purchase loans in the wake of the Great Recession and remained tight in 2012. FHA estimates that in the first quarter of 2009 it supplied 89 percent of purchase loans with downpayments of 5 percent or less. Even in the first quarter of 2012, it commanded an 83 percent share. And FHA supplied more than half of purchase loans with downpayments of 10 percent or less in the first quarter of 2012. Indeed, FHA has played an outsized role in the home purchase market, largely as a result of its willingness to take on low downpayment loans and at lower credit scores than Fannie Mae, Freddie Mac, or conventional lenders without FHA insurance. While FHA scaled up both its refinance and its home purchase loan endorsements to fill the void left by the exit of lenders willing to lend without a government guarantee after the housing bubble burst, FHA supplied just 13 percent of refinance loans originated in 2010 but nearly half (48 percent to be more precise) of home purchase loans (net of manufactured homes). 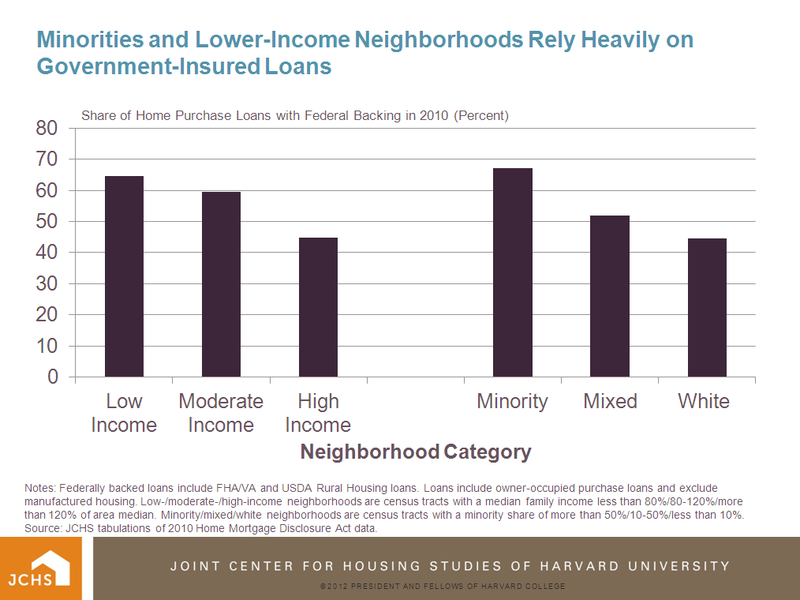 As important as FHA has been for home purchasers more generally, it has been especially so for low-income home purchasers, minority home purchasers, and those buying in low-income or predominantly minority census tracts. 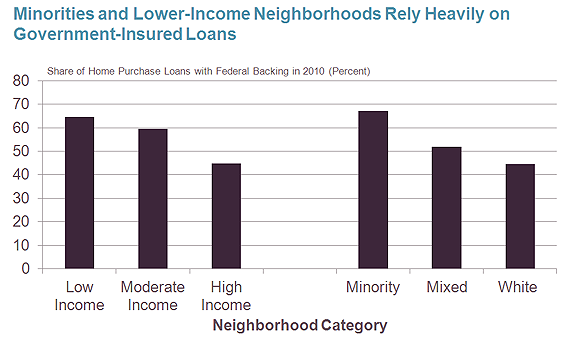 For example, in 2010 government backed loans (which are mostly FHA) accounted for roughly two thirds of home purchase loans in low-income and mostly minority neighborhoods. But home purchasers outside of low income and mostly minority tracts relied on FHA as well, though to a lesser degree (click chart to enlarge). Notes: Federally backed loans include FHA/VA and USDA Rural Housing loans. Loans include owner-occupied purchase loans and exclude manufactured housing. Low-/moderate-/high-income neighborhoods are census tracts with a median family income less than 80%/80-120%/more than 120% of area median. Minority/mixed/white neighborhoods are census tracts with a minority share of more than 50%/10-50%/less than 10%. Source: JCHS tabulations of 2010 Home Mortgage Disclosure Act data. And it is not just FHA’s role in allowing a recovery in home sales that has elevated its importance since it was called upon to play the historic mission it was created to serve. Unlike single-family building which has only started to revive in earnest, multifamily construction increased by 54 percent in 2011 and is on track to increase by another 40 percent in 2012. In the 12-month period coinciding with the 2011 fiscal year in which FHA endorsed loans for the construction of about 30,000 units in multifamily (5+ unit) buildings, construction was started on 143,000 such multifamily units. That same fiscal year, FHA endorsed loans for the purchase or refinance of another 146,000 multifamily apartments, providing needed liquidity to the market. Why is recognizing FHA’s crucial role in supporting a housing market recovery so critical? For one, the recovery is still in its early innings and private capital will likely take time to do more low downpayment and lower credit score lending. For another, FHA has fallen below a 2 percent capital reserve requirement against insurance-in-force. This means it is under pressure to tighten underwriting standards to bring up its capital levels. So far, FHA has not required any cash infusions, in contrast to several private mortgage insurance companies that have failed, banks that have needed bailouts, and Fannie Mae and Freddie Mac that have had to draw on Treasury to the tune of about $187.5 billion thus far under the Senior Preferred Stock Purchase Agreements. While this could change given the inevitable elevated level of claims stemming from the collapse in home prices, FHA has been able to pay for most claims from premiums it is taking in. But there are no guarantees. To date, FHA has taken many actions to shore up its financial position, including increasing premiums, lifting the minimum downpayment necessary from 3.0 to 3.5 percent, placing credit score boundaries around who can qualify for a 3.5 percent downpayment, and, importantly, increasing enforcement actions against lenders, tightening lender approval standards, and reducing seller concessions from 6 percent of home’s sale prices to the greater of 3 percent of sales price or the appraised value or $6,000. These changes have dramatically increased the chances that its new business will be on sound footings. But pressure may build on FHA to do more. If that pressure translates into a more dramatic reduction in the availability of low downpayment loans, the housing recovery will almost surely suffer. At the same time, borrowers who present reasonable risks will miss out on what may be a great opportunity to build wealth through homeownership.